Hello, and welcome to 2018! It may be cold outside where you are, or it might be stifling hot. 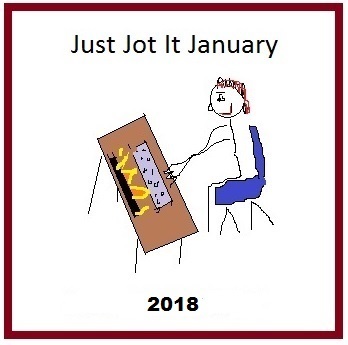 One way or another, I hope you’re comfortable at your device and ready for your first prompt here at Just Jot it January! Pingback: #JusJotJan 2018. January 1st Drama | Rhyme and No Reason! Pingback: Read it in the tea leaves – #JusJoJan 25 | Forty, c'est Fantastique ! Pingback: Liberty – #JusJoJan 22 | Forty, c'est Fantastique ! Pingback: Darkness – #JusJoJan 19 | Forty, c'est Fantastique ! Pingback: Revolt – #JusJoJan 18 | Forty, c'est Fantastique !